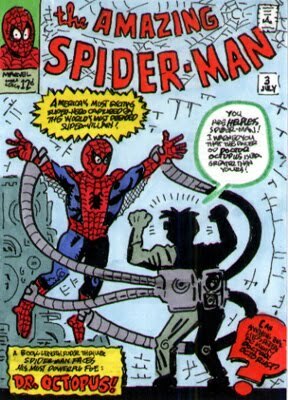 Original cover by Steve Ditko; Marvel 1963. Fred Hembeck's website is here and his original can be purchased here. 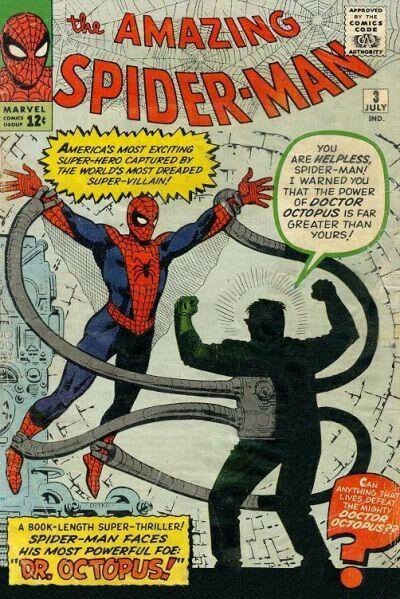 Happy Birthday to the Godfather of the cover re-creation! I wish we lived in a world where Fred Hembeck didn't have to sell art on eBay to make money. That guy is a national treasure. I always think about original art sales as a way to make any money at all in comics. It seems like unless you are a mainstream super hero guy, you have to work all of the revenue streams just to pay rent. That's my fantasy anyway. I've never made more than a few thousand a year in comics. I couldn't even pay my electricity bill. Which I guess proves your point. It would be great if there was more money in comics. In a perfect world, Fred Hembeck would use his original art to light Cuban cigars at his French châteaux. It would be great if there was more money in comics, especially for some of the older guys who helped build the industry. It bums me out when I'm at Target and see a t-shirt with Jack Kirby art (happened just the other day), and think about what a bum deal he got. And then you hear about some of these guys holding fundraisers or selling original art/sketches to pay medical bills.